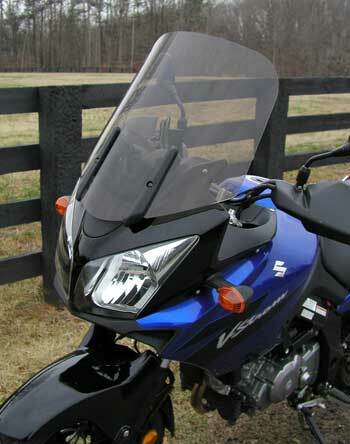 The Parabellum replacement windshield for the Suzuki DL650/DL1000 V-Stromis made from D.O.T. approved, 5mm (3/16 inch) thick, cast military aircraft grade acrylic SPECIFIED FOR OPTICAL CLARITY. The windshield mounts like the stock shield and is 4.5 inches wider than stock. It is offered in three heights to accommodate different height riders. measurements are from top to bottom up the center of the shield. I just wanted to touch base. I went to alaska in 2011 from ontario canada. I went south west first to arizona. I was riding a 2005 suzuki 650 vstrom. I had a new parabellum windshield on. A very large pheasant came out of the ditch near dodge city and I hit him at 70 mph. It hit directly on the windshield which saved me although it destroyed it. You sent me a new one free of charge and shipped free to arizona.I was so grateful. My trip continued and I put on 18,000 miles in 3 months camping .I came home and bought a new vstom and transfered the windshield. Since then I have been to california,nfld and lots of trips totalling well over 100,000 miles. I want to send a few pics of the bike with it on and thank you again for such a great product and over the top service. Please print this on your web site for customers to see.I also had one on my r80 rt bmw.